Who said shoveling had to be boring? Oh, and don’t forget that snowball fights are encouraged to help build up your arm strength and to help pay back your friends and siblings for all those embarrassing stories they’ve ever told about you. In all seriousness, be careful in the snow, everyone! Don’t trip and fall, otherwise you might be going to see a physical therapist soon (and maybe you’ll meet me?) But really, you can get some very life-altering injuries from a slip! Drive safe and be careful! Plain greek yogurt, granola, flax/chia seeds, cinnamon, ANY fruit you like (blueberries, strawberries, more bananas, raspberries, etc). 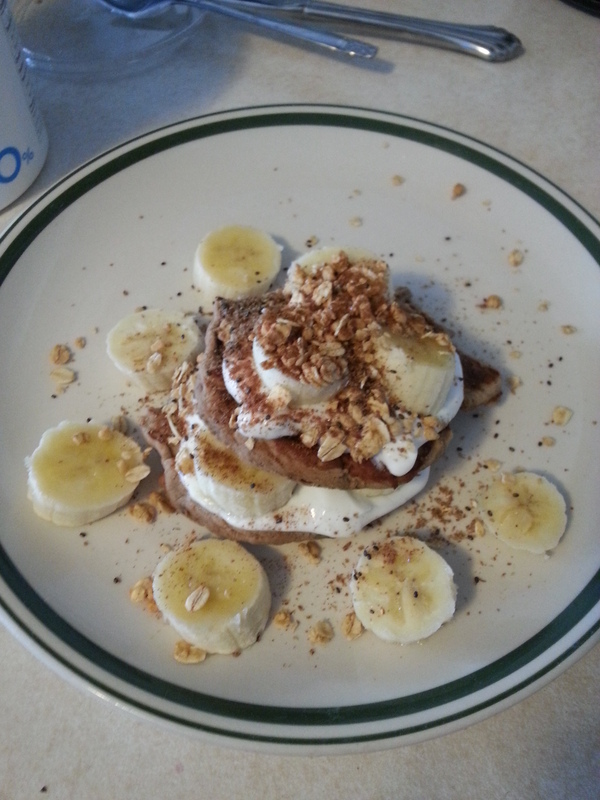 Separate your protein pancakes, then layer them filling each layer with greek yogurt and whatever YOU want to add! 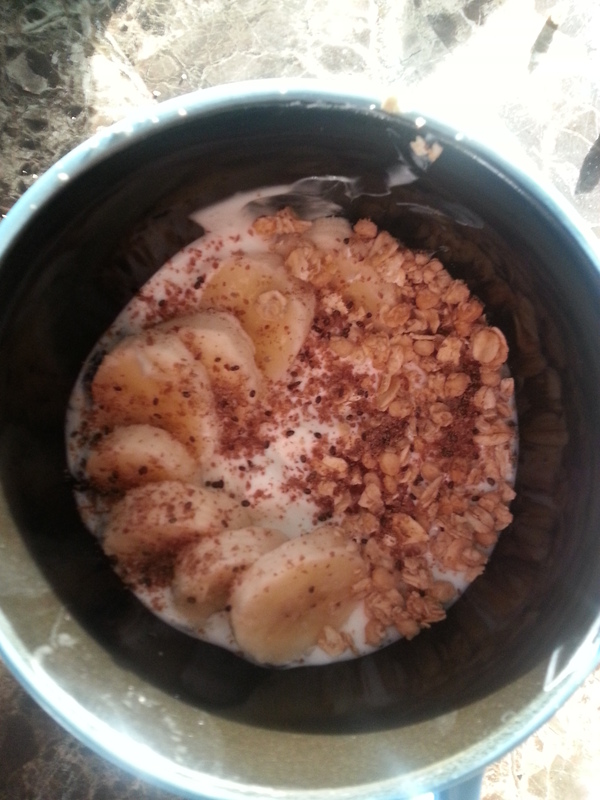 I added bananas into each layer (pictured above). Then, once you put together your leaning tower of pancakes, top it with a little more greek yogurt, some granola, and more fruit. I also added flax and chia seeds because I like to add a little extra omega-3s to my life. Then, I sprinkled a little cinnamon on top to add a little flavor without adding any sugar. Option 3) Smoothies or smoothie bowls! Sweet vintage bowls, right? 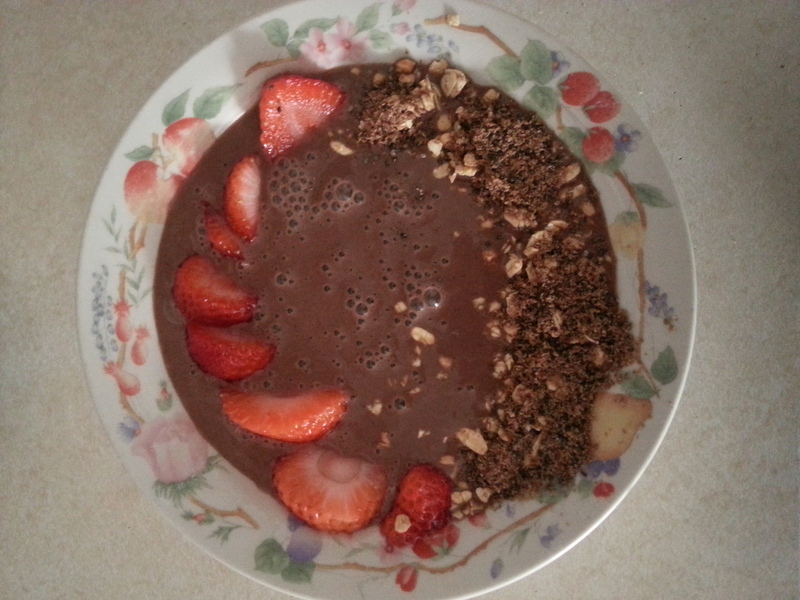 😉 Above, I made a chocolate strawberry protein smoothie bowl. The ingredients I used are: chocolate protein powder, dark chocolate almond milk, a cup full of chopped strawberries, flax and chia seeds. Then, I put it in a bowl, cut up a few more strawberries and sprinkled some granola, and more flax and chia seeds into the mix. Super quick and easy! And if you don’t want to make the bowl, you definitely don’t have to!! You can just drink the strawberry-chocolate deliciousness by itself. Bananas – always gives a nice texture. Plus they are inexpensive (comparatively) and delicious! Kale/Spinach – making a green smoothie always makes me feel a little better about myself.. just be careful and make sure it is completely blended up before you drink it! Avocado- Just make sure it is not TOO ripe – because it then alters the flavor and can taste a little strange. I’d also recommend not using an avocado and a banana together because the smoothie may then become a little too thick for your drinking likes! Oats – this tends to fill me up a little more when I have these in my smoothies. Strawberries, blueberries – they are just always yummy and blueberries are packed with antioxidants, so why not? Milk – whether it be almond milk (lower in fat), soy milk, or regular milk (higher in protein), I use milk as a base a good bit to help smooth everything out. Coconut water – This helps to improve hydration even more than just regular water! Just remember, when noting any recipe, you must realize that EVERY person is different based on the lifestyle you live, what activities you do, etc. Whereas a weightlifter or bodybuilder may be looking to have a high protein diet and at times disregard carbohydrates, a runner or endurance athlete may look to increase carbohydrates – especially the week before a race. It is also important to recognize how your body responds to various food types. Allowing at least 3-4 hours between a meal and a contest/race/competition may be necessary for those who experience any sort of anxiety or stomach aches, whereas a pre-workout meal 10 minutes before may be necessary for those who experience hunger during their workout – because hunger can be distracting!! Especially if you get hangry (so hungry, you get angry) like I do ;). Even with those who compete in all day tournaments, track meets, or other longer competitions, eating throughout may be necessary to keep energy levels high and maintain proper nutrition. (1) Make sure you listen to YOUR body and what it is telling you! Have a great day, everyone!! I hope you get a chance to experiment with some healthy foods soon. Maybe even try them tomorrow morning? 🙂 Look forward to more exercise moves next post! 1) Baechle, T. R., Earle, R. W., & National Strength & Conditioning Association (U.S.). (2008). Essentials of strength training and conditioning. Leeds: Human Kinetics.